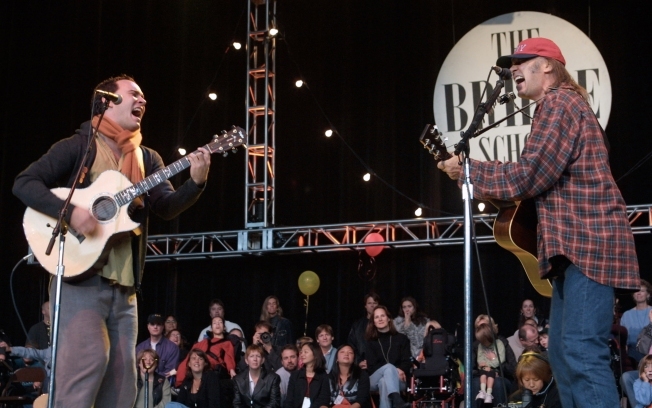 Neil Young rocks out with Dave Matthews at the Bridge School benefit. This year he will be joined by the likes of No Doubt and Adam Sandler. When Neil Youngisn't busy saving the auto industry and tricking out 5,000-pound 1959 Lincoln Continental's to get 100 miles per gallon, the old man rocker still manages to find the time to help children with severe physical impairments. Every year Young and his wife Pegi, manage to convince some of music's biggest acts to unplug their guitars and play the Bridge School Benefit concert in Mountain View, while donating their proceeds to the school that helps children in need. This year Young has lined up a diverse line up including No Doubt, Gwen Stefani's husband Gavin Rossdale, Jimmy Buffett, Chris Martin of Coldplay, Sheryl Crow, Fleet Foxes and more. The added twist for this year's two day concert is the addition of comedian Adam Sandler, who has been known to sing a song or two of his own. Past performers at the Bridge School Benefit concerts have included Paul McCartney, Metallica, Elton John, Bob Dylan, Bruce Springsteen, Foo Fighters, Bonnie Raitt, Pearl Jam and more. Tickets for the concert on Oct 24 and 25 go on sale Sept. 20 at 10 a.m. for $150.00 and $75.00 for reserved seating and $39.50 for general admission.